Last Kid's birthday, we ordered food from our local club and generally we went with the suggestions made by the restaurant. 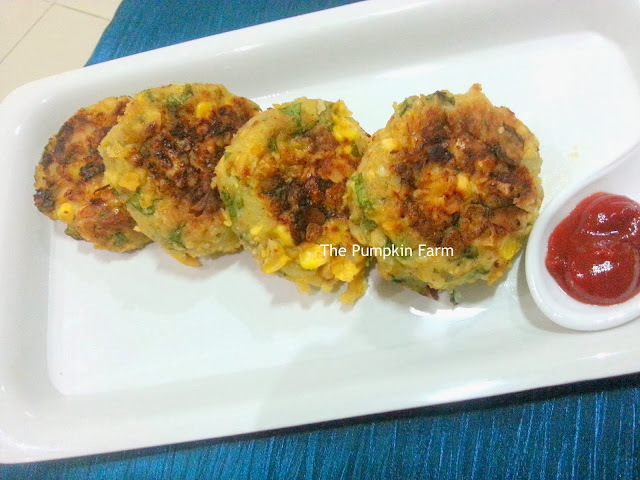 One of their appetiser was called as amritsari tikki. It was no way related to any amritsari style dish. It was the best food item on the list and all from kids to adults enjoyed it immensely. 2) In a large bowl, mix the corn kernels, fresh spinach, mashed potatoes, ginger garlic, garam masala, dry mango, chilli and salt. 4) Now form small balls, about large lemon sized, create a depression in the centre. 7) Use a nonstick pan and brush it with oil. 8) Place the patties and get them roasted until they are slightly golden. 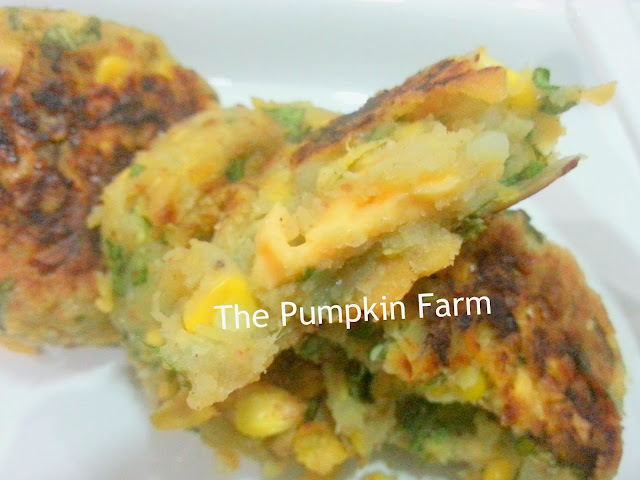 These nutritious and yet delicious tikki/ patty are loved by kids and love the melting cheese layer in between. delicious recipe :) love the stuffing !! These tikkis sounds so interesting and I hope my son love it..Wanna to try for his lunch..
Wat a delicious tikki and seriously that stuffing sounds prefect for kids. That is a healthy recipe..and the tikis are mouthwatering with my fav.corn in it. Yummy snack. Perfect for kids and adults too. Delicious and healthy tikkis ! This looks good Pradnya. What else did you have for the b'day party? The cheese in between will definitely win the child's heart! Those tikkis look awesome. Bookmarked to be tried soon. Tikkis looks really tempting! Love it as a snack.